Shiva is the primordial Guru and also the primal force of all Consciousness. In the form of the Nataraj, Shiva performs a dance that constantly creates, maintains, sustains, destroys, and gives grace to the world. He dances upon a demon, symbolizing the creative power of Consciousness to overcome anything that might limit our being. This image is, for me, about the fire of life, the fire of liberation. 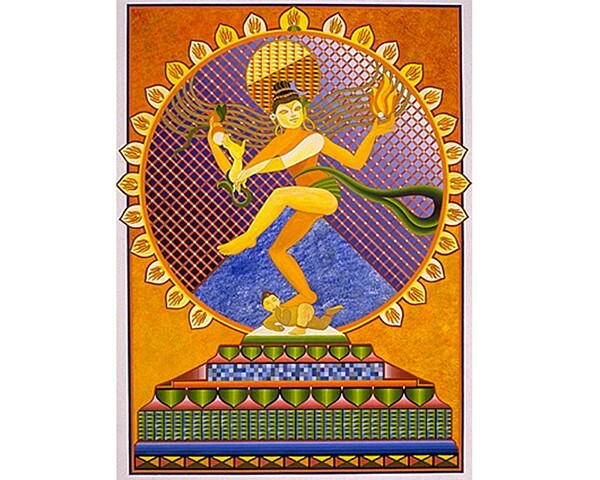 The orange hues represent the sun-like energy of Shiva’s creative impulse and the lightness of his being as he spins universes into manifestation.